Silly Putty, everyone had it! But why? Silly Putty has a very extensive history. For me, however, Silly Putty was a traditional gift my brother and I would receive in our Easter baskets or Christmas stockings. 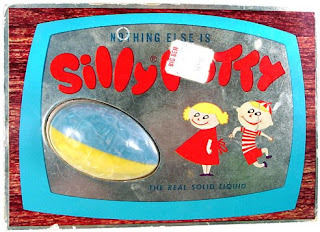 Silly Putty -- still available in most toy stores or through Amazon -- was fun for about ten minutes, tops. My favorite thing to do with Silly Putty, was to press a flattened putty on newsprint and gawk at the print remaining on the Silly Putty. Uh-duh? Yes, I know Silly Putty has a place in our hearts and memories, but much like Slinky, it was sort of a lame toy. You gotta admit that. View an old commercial for Silly Putty. Ralph Macchio in Teachers in 1984. 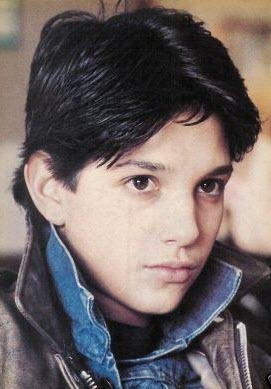 In October, 1984 I was 12 and head-over-heels in love with Ralph Macchio. Back in June of that year I was smitten after Karate Kid. The first thing that comes to mind when I think of 1984 is Ralph Macchio. Even my name was sort of borrowed from Elizabeth Shue’s character who sweetly tells Daniel her name is, “Ali with an ‘i!’” I was, “Ally with a ‘y.’” I told all of my new friends at Girl Scout camp that summer. Once Karate Kid was no longer in theaters, I kept my eyes glued to the teen magazines. I anxiously awaited the 411 on Ralph’s next film. Tiger Beat and 16 were all abuzz about Teachers, a movie costarring Nick Nolte and Judd Hirsch. Big deal, Ralph Macchio was the only guy I cared about. 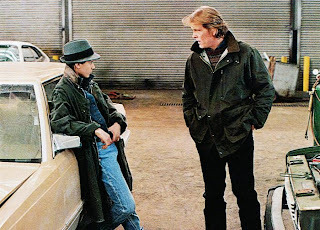 Ralph Macchio with Nick Nolte in Teachers, 1984. Teachers centered around a rough and tough high school filled with delinquents. The trailer was peppered with shocking, explosive classroom scenes we suburban kids never actually witnessed in our own quiet, sleepy schools. Well, at least that’s how it was for me back then. My dad taught high school on Long Island and has some wild stories of '70s and '80s gangs and whatnot. 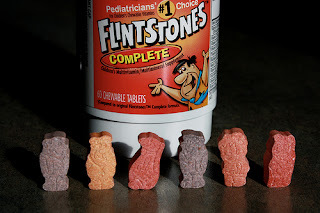 The point of this blog is to share with you my childhood heartache. Teachers was RATED R. I wasn’t allowed to see any RATED R films. I remember my mom (also a teacher) telling me, "You aren't even close to the appropriate age for an R-Rated movie. It just wouldn't be right for a child to see such adult content." The tears and diary entries caused by this tragic event were unbelievably dramatic. My life was over. I was like a Justin Bieber fan without a concert ticket. It was probably the most devastating travesty during the fall of 1984. Ralph, how could you do this to your young fans? That was the end of my crush. I believe I was all about Growing Pains’ Kirk Cameron from then on. "Butterfly in the sky! I can go twice as high!" ... "Take a look! It's in a book! A reading rainbow!" We loved the song. We loved the graphics. We loved to read thanks to Reading Rainbow. 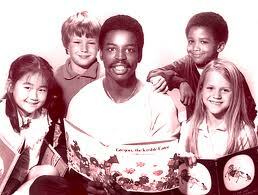 Reading Rainbow, hosted by the lovable LeVar Burton, is an award-winning (26 Emmy Awards!) 30-minute PBS TV program. LeVar recently told Mashable that a Reading Rainbow app and more is coming soon for today's readers. 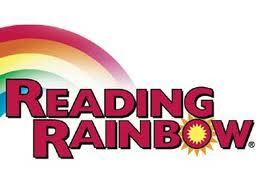 Reading Rainbow was introduced back in 1983 and continued to enlighten and educate children through 2006. Each episode focused on a different imaginative book and was narrated by a noted celebrity. 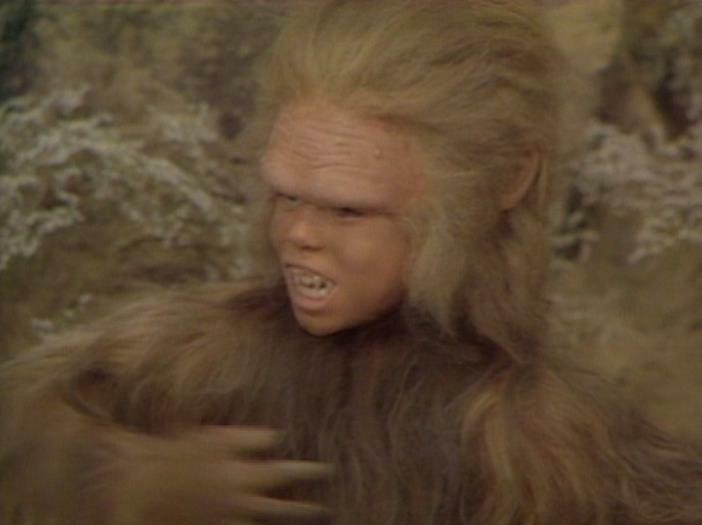 Famous for its easy-to-remember theme song, Chaka Khan sang the intro in later episodes. Reading Rainbow has won more than 200 awards. On March 19, 2010, LeVar Burton tweeted that a Reading Rainbow 2.0 is in the works. playground in the late 1970s. Growing up on suburban Long Island, there was nothing more exciting than a McDonald's birthday party. It was basically a rite of passage. My brother and I both had one when we turned six. I remember the choice of cheeseburger or plain hamburger with fries. They did not have nuggets back then. I LOVED the phenomenally delicious chocolate cake with white icing. If I close my eyes, I can still see Ronald McDonald’s smiling clown face staring back at me. His gloved hand wrapped tightly around perky colorful balloons. I remember making a wish that Ben would fall in love with me that year. Instead he tore up my birthday invitation. Oh well. I was a weird kid even back then. Who has crushes in first grade? Me of course. I remember my classmates happy faces and fun gifts. Best of all, I remember running through the McDonald’s playground on my sugar high. Today the playground is indoors and made almost entirely of plastic. 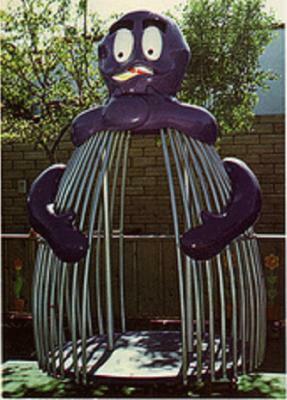 Back in the 1970s and ‘80s, the McDonald’s playground was outside of the restaurant. 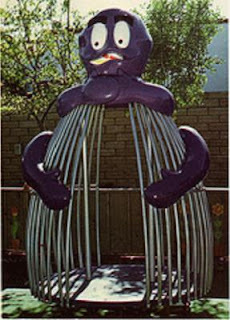 Oversized McDonald’s characters such as Grimace and Mayor McCheese in the form of slides, monkey bars and more created a fun place for kids to play. Such simplicity ... Such joy. Anyone remember having a birthday party at McDonald’s or playing in their hometown’s old school retro McDonald’s playground? Friday Night Videos on NBC. 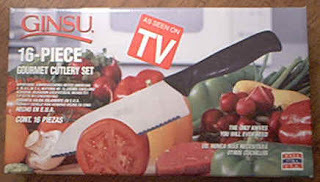 Back in the early 1980s, cable TV was a luxury to most kids. For teens without MTV, NBC's late night music video show, Friday Night Videos, was the next best thing. With celebrity hosts ranging from Hulk Hogan and Pee Wee Herman to Sean Lennon and Yoko Ono, Friday Night Videos aired the latest and greatest music videos. 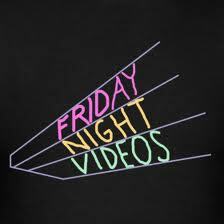 Friday Night Videos was a staple for most American teens throughout the '80s. The first thing that comes to mind for me are sweet memories of sleepovers with friends. We'd set our hair in those long colorful rollers, wash down Doritos with New Coke and of course, tune in to the hottest videos from Van Halen, Tears for Fears, Madonna, Billy Joel and more. Don't remember Friday Night Videos? Here's a sample from 1986 featuring one of my personal favorite teen '80s stars, Jason Bateman and his sister Justine Bateman. 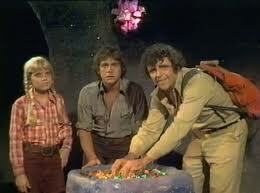 Sid and Morty Krofft's Land of the Lost first aired on NBC between 1974 to 1976. I was too young for the original broadcast, but remember watching the show after school at Grandma's in the early 1980s. The show focused around Rick Marshall and his two children, Holly and Will and their strange encounters into the bizarre prehistoric world they fell into. I wasn't a big fan of Land of the Lost, the corny special effects and the family's adventures outsmarting dinosaurs and cavemen. One particular caveman they befriend is young Cha-ka or Chaka. This freaky looking beast scared the heck out of me. Check him out. Chaka freaked me out back in the days. View the intro video to refresh your memory. Introduced by Parker Brothers in 1971, Gnip Gnop was ping pong spelled backward. 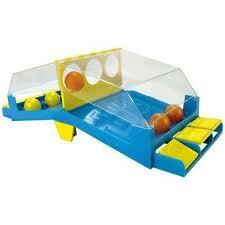 The object of this two-person tabletop game was to hit tall six balls into your opponent's side first. Although I was very small when this game was popular, I know I've played it. I'm guessing someone's older brother or sister had it. Check out this vintage Gnip Gnop commercial. The Electron Echo mini piano was so cool. 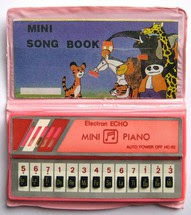 Who remembers the Electron Echo little mini pocket keyboard pianos? I honestly have no recollection of when these vintage mini pianos were popular, I'm guessing very early 1980s or late 1970s. I'm having trouble finding any info about them. They came in pink for girls and blue for boys. They were packaged in a little inexpensive plastic case which included a simplistic music song book. Please post a comment if you had one or recall seeing them back in the days. I'd love to find one of these Electron Echo tiny mini pocket keyboards.